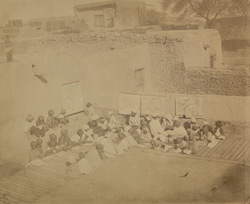 Photograph of a class in progress in a government village school, possibly at Musang in the Punjab from the Archaeological Survey of India Collections: India Office Series (Volume 46), taken by an unknown photographer in c. 1870. This image shows pupils seated on rugs in a courtyard, with maps affixed to the walls behind. In Indian vernacular education (in the local language) this was considered a special obligation for the government from 1854 when it was declared a concern by the Court of Directors. The vernacular course covered both primary and secondary education and was carried out in many different types of establishment depending on the resources of the area. The Imperial Gazetteer of India states, "There are three classes of secondary schools - the vernacular and English middle schools, and the high schools. The vernacular middle school course is a prolongation of the primary course, and completes the instruction of those who do not aspire to an English education. In most Provinces the course lasts for three years, and should be completed at about the age of thirteen...The English secondary school stage is divided into middle and high school sections, which really form portions of the same course...the English school education should ordinarily be completed by the time the pupil attained the age of sixteen...In English secondary schools the main course has hitherto led up to the matriculation or entrance examination of one or other of the Universities."